Jane Harris Luongo, cartooning instructor at Darien Arts Center. Taken Nov. 26. 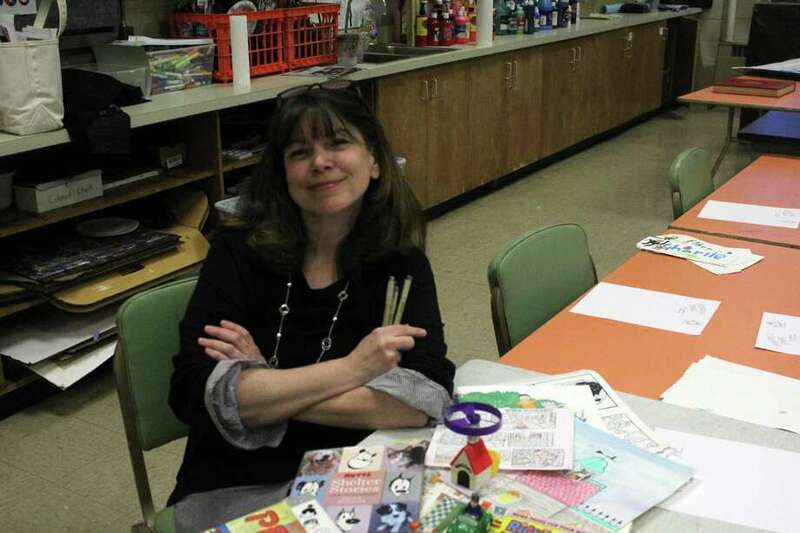 DARIEN — Jane Harris Luongo joined the Darien Arts Center in September as an instructor in cartooning, a passion that stemmed from her childhood. Her father did realistic pencil portraits of people and animals. Growing up, she said she loved reading Harvey comics like “Casper” and “Richie Rich;” her family also enjoyed cartoons from the New Yorker. Harris Luongo’s passion led her to do one-panel comics for Hit magazine in the late 1980s. While attending the University of Connecticut, she worked at Chemical Color Plate in Bridgeport as a colorist, working on some of the most recognizable comics in the country. Harris Luongo’s work there would further fuel her fascination with comics and art. In college, she got a degree to teach elementary school students, and now working at the Darien Arts Center has given her the opportunity to combine these passions, she said. Her style originated from the numerous books her mother would bring to her from the library. Harris Luongo said every week they would get a stack of books. Harris Luongo said she enjoyed the format of comics and telling a story in a short space. Cartooning is a way to combine storytelling with art, she said. “You’re creating characters. You’re creating often humorous, but not always, situations,” she said. In her cartooning class at the Arts Center, students learn how to write within a comic format, the fundamentals of storytelling, character development and more. Students also do various drawing games and participate in skill-oriented activities, though Harris Luongo makes sure to keep it a fun and creative experience. One thing she finds impressive is the class’ combination of creativity and sense of humor. Her students, ages 7 to 12, grasp comedic timing and how to place it in their cartoons, she said. Schools and art centers are important, she said, and teaching children art and fostering their creativity is important for not only them, but society as a whole. “That creativity leads to problem-solving, invention and innovation in the future for all of us,” Harris Luongo said.